On this day in which the American death count in Iraq passed 4,000, I offer a visual distraction. Check out this video from Harvard and the Howard Hughes Medical Institute. It's a handsome depiction of some basic cellular processes. In reality, the action of these molecules isn't so graceful; at that atomic level, movement is messy, frenetic, and quite random. An accurate depiction would have made for a seizure-inducing video, so we'll let that one slide. The specific physics don't really matter, just keep in mind that most of those processes are going on in your body trillions of times a second. There are a bunch of other videos on YouTube of course, but also here. Yesterday was Easter Sunday. Not unlike any other Sunday for me; I watched Food Network over breakfast, went to lab, blogged about cereal. I also ventured to Best Buy to return a wireless-internet router, only to arrive at an empty parking lot. Best Buy gave their employees the day off to hunt eggs and eat chocolate bunnies, it would seem. This was irksome, sure, but luckily the adjacent Borders was open. I bought two books (that I have no time to read). More disturbing was the "CNN Presents: The Mystery of Jesus" special I viewed when I got back. In an attempt to delve into the controversial history of the life of Jesus, CNN interviewed several religious scholars on his prophetic exploits. What is pretty certain are the main biographical elements like his place of birth, teaching, and crucifixion. What of the rest, such as the purported miracles and resurrection? Well CNN took a less than critical line on these events, concluding that "science can't account for them" but never questioning that they happened in the first place. (Just like science can't account for, ahem, the Easter Bunny?) The lone source material for all of this deep inquiry - the four gospels of the Bible. No mention of the myriad other accounts of Jesus' life, nor the contradictions implicit within the New Testament. To put a big disturbing cherry on top, CNN gets Liam Neeson to narrate. He might as well have been proselytizing the midi-chlorians. Oh, I'd hate to end on such a cynical note. Here's another video (cell wars). Continue reading "Cells and Easter wrap up"! 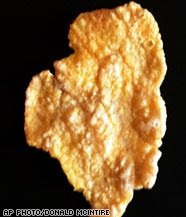 Some collector has purchased a cornflake shaped like Illinois on eBay for $1,350! You read that right. No, it doesn't resemble the Virgin Mary or Hanna Montana, but a state. I find this sort of behavior stupid on principle, but in this case it is especially inane because the cornflake doesn't look that much like Illinois. Eh? I don't get it. If you flipped it over, it could pass for Michigan, or perhaps Georgia. And why restrict ourselves to the USA? Rotate that flake 90 degrees and you've got a spitting image of the Ukraine. Or Greenland. Definitely Mongolia. I'd pay 5,000 Hyrvnia, easy. The best part of this is that copycat auctions are springing up. Stuff inexplicably shaped like other stuff! Let the bidding begin. Continue reading "So stupid, it burns"! We picked the above based on three dimensions - milk source, region, and texture. These won't be made explicit when the tasting occurs, but we're hoping they are pulled out in the analysis. 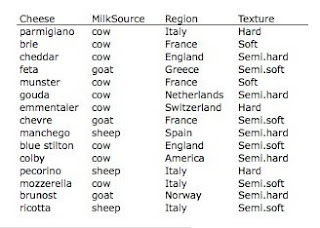 So theoretically, parmigiano and pecorino will cluster based on texture and region, which are the same, but perhaps not by milk sources, which are different. I'm skeptical that people can be that discerning, but it would be cool. I had a few more cheeses on the list, but we cut them out to keep the number of pairings down to a reasonable number. One of them, oaxaca, is a mexican cheese used in quesadillas and nachos. It's made by a stretching process similar to mozzarella, but melts much better, so it makes excellent queso dip. I hope to find some at Whole Foods or one of the markets in town. Another one that did made the list, brunost, accounts for 25% of all cheese eaten in Norway. I've never had it, but it's supposed to have a very strong flavor that some people love, some people hate. One of my group members, Eila, let me borrow her copy of Steve Jenkins' Cheese Primer, an impressive 576 page tome. I am fast becoming a cheese nerd (if such a thing exists). Like beer, wine, olive oil, and few other foods, cheese is made from surprisingly simple ingredients and yet thousands of varieties exist. How can you not appreciate a food that relies on bacterial cultures for flavor? Continue reading "Cheese news. Good news?"! 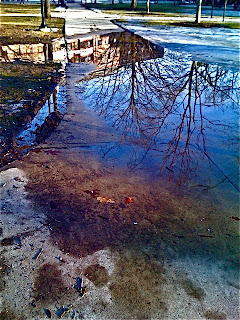 When I lived in Morgantown this never happened because of the mountainous topography; everything drained into the river. Ann Arbor is unnervingly flat. Yet another graduate school adjustment to make. Speaking of academics, my paper from undergrad is finally available as an electronic publication online. I am now searchable on PubMed, the principle database for biomedical scientific papers. This is cool but, sadly, a little anticlimactic. An upcoming assignment in my statistics class involves multi dimensional scaling. Don't ask me to describe what that means in depth, but it is an analysis technique for visually examining similarities and dissimilarities among data. MDS might be used by a marketing department to determine how consumers categorize their products into perceptual groups. Sprite and 7Up, for example, would cluster closer than Sprite and some variety of root beer. It's also used for more serious ecology or computer science research. This is a group project, so I'll be working with the other first-year students from my area. Our subject will be cheese, as per my suggestion. Today I compiled a tentative list of the cultured curds for analysis. Once we finalize this and do our similarity tests, I will post the results, along with some cool graphs. Cheese! Continue reading "Drainage issues, E-pubs, and Cheese"! I was recently asked to contribute to a discussion group on Nature Network, this social network site for scientists/enthusiasts run by the Nature Publishing Group. I picked a cool article about drug craving. My post is here. Social networking is everywhere. The nice thing about a site like that is that you can talk about research with some anonymity and no social repercussions. If you look like an idiot, no problem, the person you're arguing with is probably on the other side of the country/world. I'm starting to worry though. At some point, I'm going to to know more people through internet sites than I do in real life. Speaking of avatars, there was an article in the New York Times the other day about the death of Dungeons and Dragons creator Gary Gygax, and how the game served as the foundation of so much mainstream role playing that occurs today. 1:30PM - fell asleep at the colloquium! 1:00AM - no time for updates, busy crying myself to sleep Continue reading "Blog contribution, and the internet will bring us together"! In a New York Times group blog, Jeff Tweedy, of Wilco, has an account of his lifelong experience with migraines. He describes growing up with depression and panic attacks that, he feels, produced anxiety so strong that migraines developed. As a result, he also became addicted to pain medications. A lot of people equate migraines and strong headaches. That's just wrong, migraines are often totally debilitating. Tweedy recalls performing shows with a vomit bucket just off stage. He used it between every song. During the making of "A Ghost is Born" his migraines were so intense he was only able to work a couple hours a day. Their recording was actually affected; some songs were kept minimalist only because Tweedy was unable to withstand long sessions. I've known a few family members who suffer from migraines, and it's amazing how most of the time, nothing helps. Like Tweedy points out, even when addicted to narcotics, his migraines were just as intense. He only got better with management of the stress and anxiety context associated with having migraines. That's easier said than done - he needed antidepressants - and migraines, like many mysterious pain disorders, never seen to go away. This is so strange to me. I'm around a lot of scientists that try to understand how the nervous system mediates the interaction between an individual's environment and its behavior. The idea is to help treat people's problems, like addiction, depression, etc. A lot of great work is done. Read a personal account like Jeff Tweedy's, however, and it's hard to see where progress is being made. It's good that people in his position can talk about this kind of problem though. Let it out Jeff Tweedy, let it out. 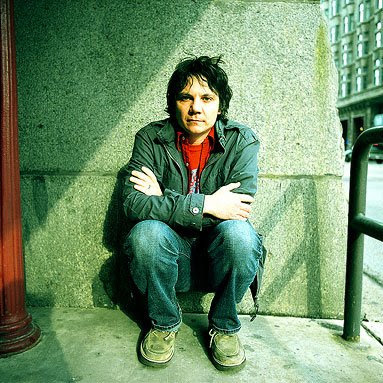 Continue reading "Jeff Tweedy on migraines"! 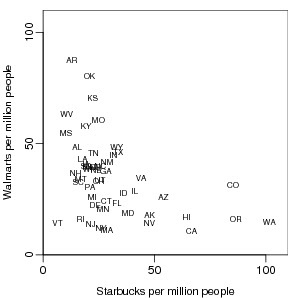 This post at the Columbia statistics blog shows the relationship between the number of Walmarts and Starbucks per million people for each state. This is interesting (but so not surprising) to me because West Virginia has the fourth most Walmarts (approximately 60 per million people) and the second fewest Starbucks (less than 20 per million people). West Virginia's population is roughly 1.8 million, so doing some fuzzy math there should be about 100-110 Walmarts. According to the Walmart Facts website, however, there are only 37 stores and 5 Sam's Clubs. That's one Walmart store for every 42,000 people. In Michigan, it's 111 total Walmart stores, one for every 89,000 people. So there is effectively twice the number of Walmart's per person in West Virginia, but the huge number implied by Columbia can't be right. And like one of the commenters mentioned, there are some Walmarts that contain Starbucks. I'd like to see a graph of the number of Chinese products per capita as a function of the quantity of lottery tickets purchased. It's correlation, sure, but it can be so telling. Continue reading "Walmart vs. Starbucks"! I've neglected this blog venture for a long time, largely because I haven't felt that my early life in Ann Arbor is interesting. I plan to post more about more things. If they are interesting, great, if not, still okay. Big news in people-I-know-who-are-moving-to-Asia world. Jarrod is all of a sudden in Shenyang, China. This life-altering development occurred over a span of eight days, with no time for long-term planning, second-guessing, or uncertainty. That's how Jarrod makes decisions - on the fly. Whether he's calling a drunk Morgantown girl pregnant, yelling at his behaviorally-dysfunctional students, or (now) relocating to another continent, Jarrod doesn't hesitate. Nick - my brother - also has Asian aspirations. He's moving to Hirakata, Osaka, Japan in August, where he will become engorged with sushi and manga for (potentially) a year. This is fantastic news for Jarrod and Nick, but it comes to me in Ann Arbor, with few decent Asian restaurants and a stressful job. No problem, though, because you can bet that I will be visiting Shenyang and Hirakata soon. Continue reading "Back at it"!